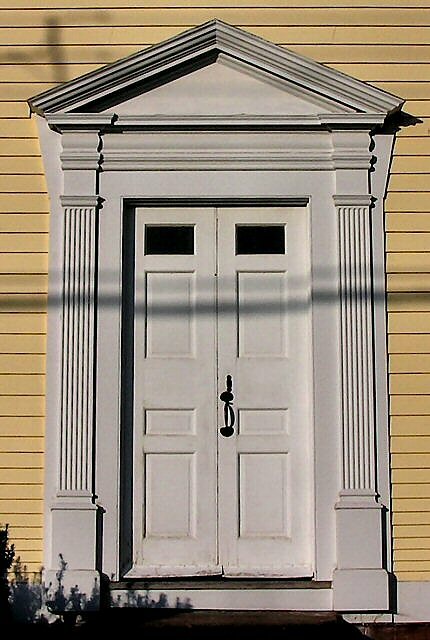 This is a Connecticut Cross Broken Scroll Pediment doorway. 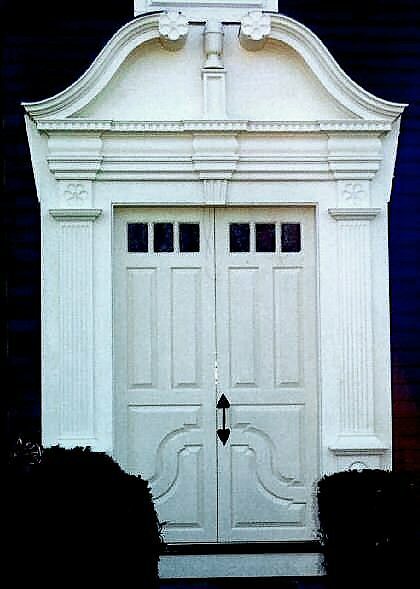 The door and all moldings are made from mahogany and the backdrop is made from cedar. 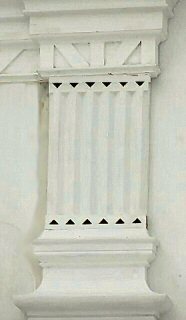 At the bottom of the fluted pilasters are tombstone raised panels (hidden). 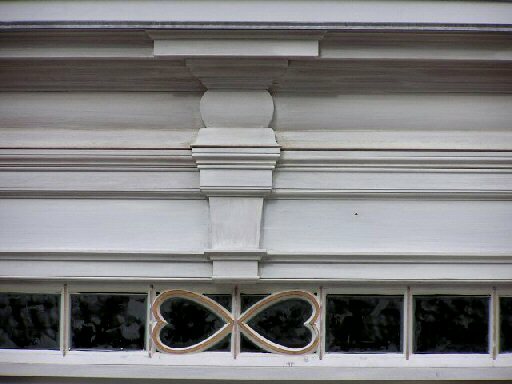 At the top of each pilasters is a 6-1/2" hand carved 6 petal rosette. 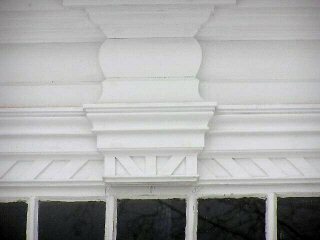 The band of 11 moldings going across bottom of the head starting from the bottom are as such: 2-1/2" flat stock w/a 3/4" round over, a 3/4" ogee, 3" flat stock, 1-5/8" dog-ear, an ogee ledge, a 4" frieze, a 1-1/8" ogee, a 3/4"quarter round, a dentil molding on a shadow box and another 3/4" ogee capped with lead flashing. On the top of the head is a 4-5/8" gooseneck crown molding terminated by a 7-1/2" hand carved 6 petal rosette atop a 7-1/2" barrel. Underneath the crown is a curved shadow box with a partial gooseneck crown molding and a gooseneck 1-1/2" quarter round on top of it. In the center is a three sided box made by mitreing 1-1/4" ogees, capped by a finial turning. The top of the curve box is also flashed in lead. The doors and entryway surround took about one month to make. This is a residential home in Bolton CT. 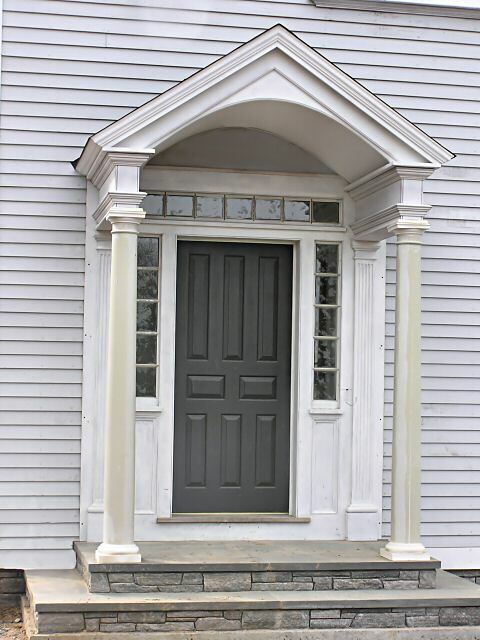 This entryway and door set is a duplicate of what was on the house. 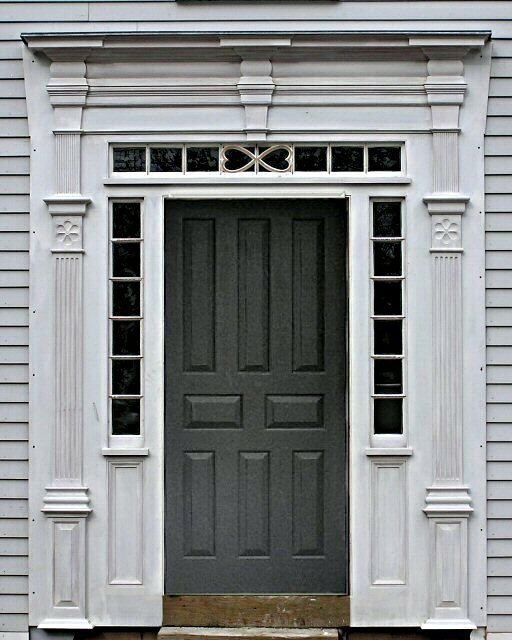 The original doorway was badly damaged by time and careless use of sandblasting equipment to strip paint. We have reproduced it and brought it back to its original glory. 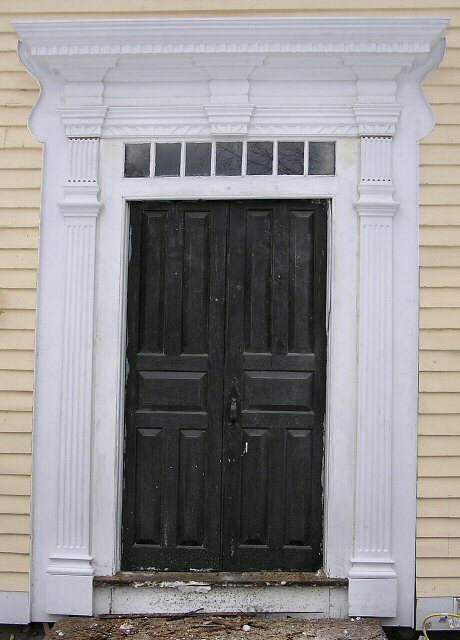 The Tombstone plinth blocks may be the only exception as the blocks that were on the house were clearly redone, we matched the plinths to the doors. 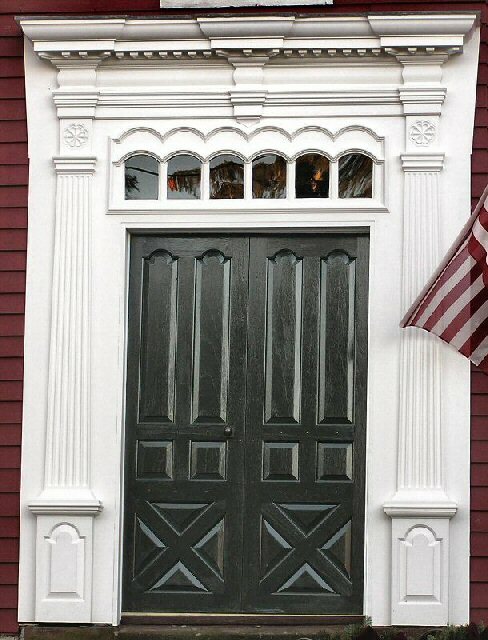 The tapered columns, the double petal rosettes, and the double eyebrows over the glass lites were some of the outstanding features on this entryway. The entire entryway was made from cedar. The backer is Red Cedar and the doors and all the moldings are from Spanish Cedar. This is a house in Simsbury, CT.